Hawaii-Hilo volleyball coach Sharon Peterson has won seven national titles with the Vulcans. When Sharon Peterson left her parochial elementary school for high school, she thought her athletic life was over. Through eighth grade, she had been active in most every sport, but when she got to high school in 1956, "the Girls Athletic Association had become the Girls Recreation Association and they were leaning away from athletics," said Peterson. "I guess it wasn't feminine enough. My high school athletic career was such a disappointment." Peterson went on to Long Beach State as a Physical Education major. She and some friends entered a six-women beach volleyball tournament, where she was bitten by the volleyball bug. I don't know if we scored any points, but I remember thinking it was fantastic," she said. "After one of the games, a woman came up and asked if any of us would like to be coached. If she hadn't come up on that particular day, I don't know where my life would have gone." Volleyball took the future Hawaii-Hilo coach to Tokyo for the 1964 Olympics and to Mexico for the 1968 Games. Between trips with the national team to the World Games and the Pan-American Games, she landed a job at Punahou School. "I felt that Hawaii was so far ahead of the mainland in terms of some girls sports," said Peterson. "When I taught in Los Angeles, they tried to scrap together a track team. At Punahou, we had 100 girls coming out and it was wonderful to see all these great athletic young women. What a paradise to come into." In 1964, volleyball made its Olympic debut in Japan. The players were celebrities. "Their volleyball teams were so awesome," Peterson said of the Japanese, whose women won gold and whose men won the bronze. "All you had to say was you played volleyball and people asked for autographs." A five-time USVBA All-American, Peterson went on to play professionally in the IVA for two seasons. In 1978, she was offered the job at Hawaii-Hilo. The initial salary was for $2,400 that then-athletics director Ramon Goya got increased to $5,400 before her first day on the job. In their inaugural season, the Vulcans finished second at the AIAW Division II nationals. In 1979, Hilo won what would be the first of seven national titles; that run included a double-dip when the Vulcans claimed the AIAW and NAIA championships in 1981. Peterson said she never felt she was discriminated against in athletics. "We were just thankful for the opportunity to play," she said. "We played for fun, without the pressure of having to get a scholarship. I think there's a lot of pressure on young girls to get a scholarship because their parents spend a lot of money for them to play club ball. "When it comes down to it, I think every generation tells the next, 'Oh, you have it so easy.' I know I didn't have it as hard because we didn't have year-round training for the national team. An all-star team was picked, we got together for three months. That was before they decided that if we were going to be contenders, the team had to train year round." Peterson said she's seen women's athletics blossom the past few years, particularly in the Olympics and with the WNBA. 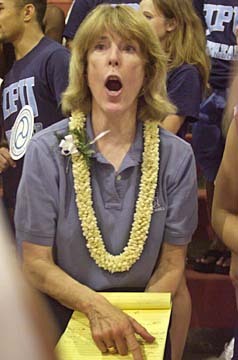 And Hilo named a woman as its athletics director in 2001: Kathleen McNally. "I've been the only female in the department for a long time," said Peterson. "It's nice to have company."